Below is a diagram I use to talk about the work of teachers and coaches. Teachers need to study student learning and student work. So major teacher behaviors are thinking, observing, creating, and experimenting. Imagine that it’s August and you know little about your incoming class. In that setting you begin thinking about “who” you believe your students will be and imagine their backgrounds, interest, skills, etc. Then considering the initial standards that you need to address, you create learning activities…journal assignments, a simulation, lectures, articles to read, etc. 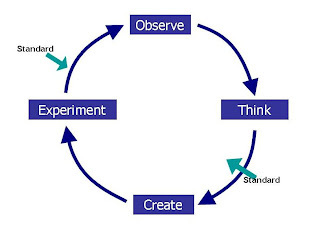 Experimenting means that you engage the students in the activities you designed. As they begin working in the learning activities, you observe what happens, often with the standard in mind (assessment) and thinking about what you observe you might see a need to redesign the learning activity. A continuous cycle directs teacher activity. New teachers do the cycle once each evening taking personal learning from the day they just completed and improving the next day’s plan. As the teacher gains experience, the cycle repeats at the end of each period. (A new teacher recently told me to come 5th period, “It’s pretty good by then!”) Highly experienced teachers are designing instruction with several differentiated plans mapped out and a set of “spontaneous options” ready to go upon almost any observation. Instruction was followed by testing and then instruction of the next standard began. A need for assessment for learning was missing. Instructional coaches and instructional leaders can picture themselves as being inside the cycle with a vision/purpose of increasing teacher observation, thinking, creativity, and experimentation. Observation: Coaching should cause teachers to see and hear things that might have been missed were it not for the coach. Sometimes this comes from the coach’s observations and other times it’s the coach shining a light where the busy teacher wasn’t looking. Thinking: One of the greatest compliments a coach can hear is a teacher in a conference saying, “That’s a really good question!”. The coach’s question has raise a thought that would have been missed. Creativity is often generated as a teacher is explaining the thinking and planning of upcoming instruction. It’s quite common that teachers change/enhance a lesson during a pre-conference with a coach. 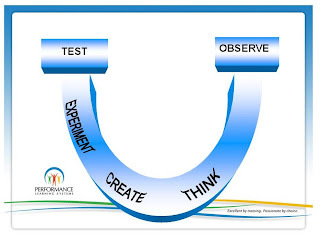 Experimentation is encouraged and supported through coaching. Teachers’ creative ideas receive a sounding board with coaching. “What ifs” are discussed “worst case scenarios” examined and risk taking encouraged. As a coach working with new teachers, it often feel like a chess game. I’m trying to get them to plan their moves while thinking of the end ahead. New teachers need to hear experienced teachers “think aloud” what does the teacher ask herself while planning, during the lesson, after the lesson.